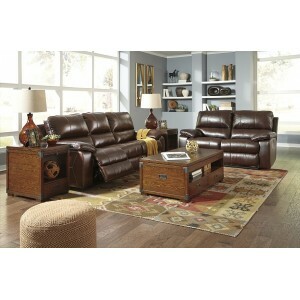 Item Description: Experience ultimate comfort of the Transister reclining power sofa and loveseat. With simple push buttons, the two seats can be reclined and headrests can be adjusted. The incredible sleek design includes seats with bustle backs and plush, pillow top arms. The entire seating area is wrapped in our highest quality leather for a luxurious feel, while a perfect leather-match upholstery on the exterior saves you money without sacrificing style. As a bonus, there is a built in USB charging port in each power control that gives you the option of keeping electronic devises charged without having to leave a cozy seat. Item Features: Frame constructions have been rigorously tested to simulate the home and transportation environments for improved durability. Corners are glued, blocked and stapled. Stripes and patterns are match cut. All fabrics are pre-approved for wearability and durability against AHFA standards. Cushion cores are constructed of low melt fiber wrapped over high quality foam. Features metal drop-in unitized seat box for strength and durability. All metal construction to the floor for strength and durability. The power reclining mechanism features infinite positions for comfort. In addition the style features a power adjustable head rest. In the power control there is a USB charging port.